Internet giant Google is moving forward on its promise to utilize more renewable, or “green,” energy resources. Several years ago, the company made the commitment to power 100% of its business entities with renewable resources and now, in what Google calls “the largest and most diverse purchase of renewable energy ever made by a non-utility company,” the enterprise has nearly doubled the “clean and green” energy at its data centers. Most of the added 842 megawatts is for Google’s U.S. locations but the company has increased its efforts in Chile and Sweden. It was back in 2006 when Google opened the doors to its first data center — a year or so later, the company announced intentions to go completely “green.” Other projects in the works include, but are not limited to, U.S. based wind farms in Texas, Iowa, Oklahoma and California. Solar power plants are in development or already operating in Utah, Arizona and California. Locations around the world creating wind and solar energy sources include operations in the Republic of Kenya, South Africa and Germany. Google is also invested in residential solar, photovoltaic and clean energy projects. Google plans to triple its purchase of renewable energy by 2025. In its White House Climate Pledge, the company states that currently, about 37% of the enterprise’s operations are “green,” with more coming in the next two years, especially in data centers and business offices. The company says renewable energy sources must make good sense for business and show ability for creating solid, long-term and positive ecological impact. 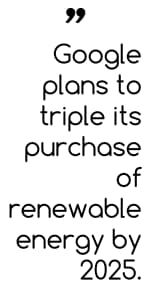 Large companies like Google that agree to lengthy renewable energy buying contracts is encouraging for suppliers like Res Americas, Duke and EDF. These businesses then have financial backing, as well as confidence, to invest more money and resources into the production of “green” products and services. Google isn’t the only Internet company to “go green.” Amazon, in the midst of a long-term partnership with Pattern Energy Group, is now operating its web and cloud service on renewable energy by way of a 150-megawatt wind farm. Microsoft is also using wind power as it plans to purchase 100% renewable energy for data centers, offices and manufacturing facilities. Apple, already running its U.S. facilities at 100% renewable energy, is invested in a number of solar farms and plans to bring more clean power generation online by the end of 2016. Internet giant Google is moving forward on its promise to utilize more renewable, or “green,” energy resources. Several years ago, the company made the commitment to power 100% of its business entities with renewable resources and now, in what Google calls “the largest and most diverse purchase of renewable energy.."